The claim: Among the many highly-publicized catastrophic consequences that climate alarmists contend will attend the ongoing rise in the air's CO2 content are predicted increases in the frequency and severity of a variety of different types of storms. In an effort to determine if this contention has any validity, many scientists have examined historical and proxy storm records in an attempt to determine how temperature changes of the past millennium may have impacted the storminess of earth's climate. Noting that the planet's mean temperature had risen by about 0.6 °C over the 20th century, for example, Easterling et al. (2000) looked for possible impacts of this warming on extreme weather events that they said "would add to the body of evidence that there is a discernable human affect on the climate." In doing so, however, they found few changes of significance, and -- as might have been expected -- that "in some areas of the world increases in extreme events are apparent, while in others there appears to be a decline," so that the overall global response was pretty much of a wash. In another study of multiple severe weather phenomena, Khandekar (2003) briefly reviewed what he had learned about extreme weather events in Canada in the course of conducting a study of the subject for the government of Alberta. This review revealed that "extreme weather events such as heat waves, rain storms, tornadoes, winter blizzards, etc., [were] not increasing anywhere in Canada at [that] time," while noting that a contemporary special issue of Natural Hazards (Vol. 29, No. 2, June 2003) concluded much the same thing about other parts of the world, citing in this context a survey article by Balling and Cerveny (2003) that concluded "there is no significant increase in overall severe storm activity (hurricanes, thunderstorms/tornadoes, winter blizzards) across the conterminous United States," as well as an article by Changnon (2003a), which concluded that "increasing economic loss due to weather extremes in the conterminous United States is a result of societal change and not global warming." More specifically, Changnon determined that various U.S. weather extremes over the last 50 years of the 20th century were mixed, reporting that "one trend is upwards (heavy rains-floods), others are downward (hail, hurricanes, tornadoes, and severe thunderstorms), and others are unchanging flat trends (winter storms and wind storms)." It should be added, however, that had the analysis of heavy rains-floods been extended back to the beginning of the 20th century, the longer-term behavior of this phenomenon would have been found to have been indicative of no net change over the past hundred years, as demonstrated by Kunkel (2003). Down in New Zealand, De Lange and Gibb (2000) analyzed trends in sea level derived from several tide gauges located within Tauranga Harbor over the period 1960-1998. And in an examination of seasonal, interannual and decadal distributions of storm surge data, they discovered a considerable decline in their annual numbers in the latter half of the record, while a similar trend was observed in the magnitude of storm surges. Also working "down under" -- with sediment cores extracted from Lake Tutira on New Zealand's North Island -- were Page et al. (2010), who developed a 7200-year history of the frequency and magnitude of storm activity, based on analyses of (1) sediment grain size, (2) diatom, pollen and spore types and concentrations, plus (3) carbon and nitrogen concentrations, together with (4) tephra and radiocarbon dating. This work revealed, as they describe it, that "the average frequency of all storm layers is one in five years," but that "for storm layers >= 1.0 cm thick, the average frequency is every 53 years." And in this regard, they report that over the course of their record, "there are 25 periods with an increased frequency of large storms," the onset and cessation of which stormy periods "was usually abrupt, occurring on an inter-annual to decadal scale." They also note that the duration of these stormy periods "ranged mainly from several decades to a century," but that "a few were up to several centuries long," while "intervals between stormy periods range from about thirty years to a century." Most importantly of all, however, they found that millennial-scale cooling periods tended to "coincide with periods of increased storminess in the Tutira record, while warmer events match less stormy periods." Studying the entire Southern Hemisphere were Simmonds and Keay (2000), who employed a new cyclone finding and tracking scheme to conduct what they said was "arguably the most reliable analysis of Southern Hemisphere cyclone variability undertaken to date." This work revealed that the annual average number of cyclones in the Southern Hemisphere experienced a steady increase from the start of the assessment period. After peaking in 1972, however, there was an overall decline; and they stated that "the counts in the 1990s have been particularly low." Simultaneously, they detected a small increase in mean cyclone radius; but they noted that this effect only served to "partially offset the effect of the remarkable decrease in cyclone numbers," which they said was "associated with a warming Southern Hemisphere." Moving back north, and realizing that "understanding the behavior and frequency of severe storms in the past is crucial for the prediction of future events," Yu et al. (2004) devised a way to decipher the history of severe storms in the southern South China Sea. Working at Youngshu Reef (9°32'-9°42'N, 112°52 -113°04'E), they used both standard radiocarbon dating and TIMS U-series dating to determine the times of occurrence of storms that were strong enough to actually "relocate" large Porites coral blocks that are widespread on the reef flats there. And in doing so, they determined that "during the past 1000 years, at least six exceptionally strong storms occurred," yet none of them occurred during the past millennium's last century, which climate alarmists claim to have been the warmest of that period. Up in the North Atlantic, Dawson et al. (2003) developed relationships between temperature and storminess from Greenland ice-core δ18O data (which correlate with temperature) and Na+ (sea-salt) concentration data (which correlate with North Atlantic winter storminess) over the period AD 1000 to 1987. And as a result of their efforts, they discovered "it is extremely rare to find any year during the last thousand when high Na+ concentrations coincided with extremely warm years," additionally noting that "the highest Na+ values are associated with years that were exceptionally cold." Also working in the North Atlantic, and employing the dp(abs)24 pressure-variability index, which is defined as "the absolute 24-hourly atmospheric surface pressure variation at a location," Hanna et al. (2008) studied its temporal variability over the past 160 years via data obtained from long-running meteorological stations in Denmark, the Faroe Islands, Greenland, Iceland, the United Kingdom, and Ireland, after first showing that the index is "significantly related to wind speed and is therefore a good measure of Atlantic and Northwest European storminess and climatic variation." This work showed, as they describe it, "periods of relatively high dp(abs)24 and enhanced storminess around 1900 and the early to mid-1990s, as well as a relatively quiescent period from about 1930 to the early 1960s." And they add that "there is no sign of a sustained enhanced storminess signal associated with 'global warming'," stating that their analysis "lends a cautionary note to those who suggest that anthropogenic greenhouse warming probably results in enhanced extratropical storminess, as this is indicated neither by our own nor existing published observational results for the northeast Atlantic for the last ~150 years." In yet another study pertaining to this region, which was based on surface pressure data from January of 1874 to January of 2008 that were obtained from eleven sites scattered throughout the northeast Atlantic, Wang et al. (2009) computed trends in storm conditions characterized by the 95th and 99th percentiles of geostrophic wind speeds, which they calculated from 3-hourly sea level pressure data over this important period of time, when the earth recovered from the global chill of the Little Ice Age and transited into the Current Warm Period, when the world's climate alarmists contend it experienced a warming that was unprecedented over the prior one to two millennia. If this was truly the case, that warming should have provided a good test of the ancillary climate-alarmist claim that such warming should produce a significant increase in storminess. But it did not. In fact, the four researchers report that for the entire study region, there was "a downward trend of at least 5% significance in both the 99th and 95th percentile series." Numerous other studies pertaining to the subject of global warming effects on storminess have been conducted throughout North America, Europe and Asia; and they all reach pretty much the same conclusions. Hence, in what follows, we report the key findings of these studies in much abbreviated fashion, beginning with North America. Changnon and Changnon (2000) analyzed hail-day and thunder-day occurrences over the 100-year period 1896-1995 in terms of 20-year averages obtained from records of 66 first-order weather stations distributed across the United States, finding that the frequency of thunder-days peaked in the second of the five 20-year intervals, while hail-day frequency peaked in the third or middle interval. Thereafter, both parameters declined to their lowest values of the century in the final 20-year period. Hail-day occurrence, in fact, decreased to only 65% of what it was at mid-century. Three years later, Changnon (2003b) expanded on this work to 110 first-order weather reporting stations finding that "the 1936-1955 period was the nation's peak of storm activity during the 100-year period ending in 1995." During this central 20-year period, 40% of the 110 first-order weather stations experienced their greatest level of storm activity, whereas during the final 20-year period from 1976-1995, only 15% of the stations experienced their greatest level of storm activity. Over the period 1885-1996, Hayden (1999) determined that for the entire continent "no net climate change in storminess [was] found," while along the U.S. East Coast, Zhang et al. (2000) could not find "any discernible long-term secular trend in storm activity during the twentieth century." In the Prairie Ecozone of western Canada, Lawson (2003) likewise could find no significant trends in blizzard frequency in eastern and central locations over the period 1953-1997; but there was a significant downward trend in blizzard occurrence in the more westerly part, with "no trend in the severity of individual weather elements." Similarly, in the prairie provinces of Alberta and Saskatchewan in western Canada over the period 1882 to 2001, Hage (2003) found that "all intense storms ["primarily thunderstorm-based tornadoes and downbursts"] showed no discernible changes in frequency after 1940," while prior to that time they had exhibited minor maxima. With respect to United States snowstorms, on the other hand, Changnon and Changnon (2006) determined that "the incidence of storms peaked in the 1976-1985 period," but they report that snowstorm incidence "exhibited no up or down trend during 1949-2000." And in a similar finding related to windstorm damages in the United States, Changnon (2009) found that "the peak of incidences came during 1977-1991," but that "the fit of a linear trend to the annual data showed no upward or downward trend." With respect to Asia, and in prefacing their work, Zhu et al. (2008) noted that "a number of studies have shown that the spring dust storm frequency (DSF) bears a negative correlation with the local surface air temperature, and exhibits a downward trend over the past 50 years," citing the studies of Qian et al. (2002), Zhou and Zhang (2003), Zhai and Li (2003), Zhao et al. (2004), Fan et al. (2006) and Gong et al. 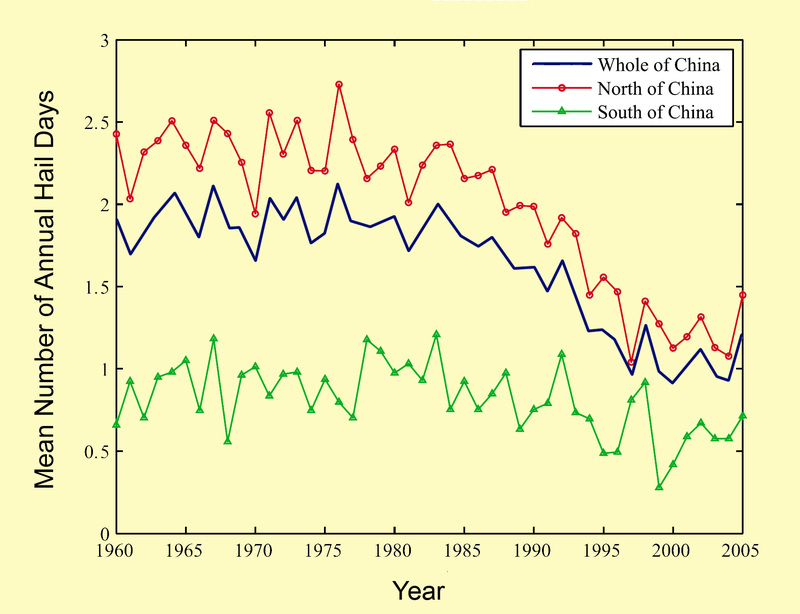 (2006, 2007) in support of this statement, after which they explored the long-term variation of Chinese DSF in spring (March to May) and its possible linkage with global warming and its related circulation changes in the Northern Hemisphere, using data from 258 stations within the region surrounding Lake Baikal (70-130°E, 45-65°N) over the period 1954 to 2007. And in doing so, they identified a "prominent warming" in recent decades, as well as "an anomalous dipole circulation pattern" in the troposphere that "consists of a warm anti-cyclone centered at 55°N and a cold cyclone centered around 30°N," that leads to "a weakening of the westerly jet stream and the atmospheric baroclinicity in northern China and Mongolian regions, which suppress the frequency of occurrence and the intensity of the Mongolian cyclones and result in the decreasing DSF in North China." Similar findings were also reported in the earlier study of Liu et al. (2004), who concluded that if global warming increases temperatures in the northern part of China and Mongolia as predicted by climate models, "the China-Mongolia ridge will continue to rise and suppress Mongolian cyclones and dust storm activities in Western China-Mongolia." Also working in China, Xie et al. (2008) studied annual variations and trends of hail frequency at 523 stations over the period 1960-2005. And as is clearly evident in the following figure, they report that the results of their study "show no trend in the mean Annual Hail Days (AHD) from 1960 to [the] early 1980s but a significant decreasing trend afterwards," which latter downturn was concomitant with a warming of the globe that the world's climate alarmists have long claimed was unprecedented over the past one to two millennia. Mean Annual Hail Day variations and trends in northern China, southern China and the whole of China. Adapted from Xie et al. (2008). Consequently, although climate alarmists continue to claim the world will experience more extreme weather as the planet warms, this study clearly suggests -- as the three researchers who conducted it conclude -- that, in China, global warming may actually imply "a possible reduction of hail occurrence." In a slight twist on the Xie et al. study, Xie and Zhang (2010) focused their research on the extremeness of hailstone size, noting that "changes in hail size are also an important aspect of hail climatology," and they went on to study the long-term trend of hail size in four regions of China over the period 1980-2005, using maximum hail diameter data. Their work revealed an uptrend in maximum hail diameter in Hebei, a flat trend in XUAR, and a slight downtrend in both Guizhou and IMAR; but they add that "none of the trends is statistically significant." And in light of these several findings, it seems pretty clear that the highly-hyped global warming of the past few decades has led to no significant increase in the extremeness of Chinese hail storms. Turning to Europe, Bijl et al. (1999) reported that at several northwest coastal stations, they could find "no sign of a significant increase in storminess" over the prior century, while over the period 1951-1997 along the northern portion of the Atlantic coast of France, Pirazzoli (2000) found that the number of atmospheric depressions (storms) and strong surge winds for this region "are becoming less frequent." Likewise, Clarke et al. (2002) determined that massive wind-induced movements of sand in the Aquitaine region of southwest France have been most common during cooler climatic intervals; and based on data pertaining to gale-force winds over northern and northwestern Scotland, Dawson et al. (2002) discovered that "storminess in the North Atlantic region was considerably more severe during parts of the nineteenth century than in recent decades." Contemporaneously, Woodworth and Blackman (2002) determined that the annual maximum wind-driven surge-at-high-water measured at Liverpool, England, declined at a rate of 0.11 ± 0.04 meters per century over the prior 232 years, indicative of a long-term reduction of regional storm winds. Similarly, for the period 1 July 1939 to 30 June 2001 at Trieste on the Northern Adriatic, Raicich (2003) found that strong positive surges clearly became less frequent over the period of study, even in the face of a gradually rising sea level. Bielic (2001) analyzed thunderstorm records obtained at Cracow, Poland for the period 1896-1995. Close analyses of these data revealed a slight but non-significant linear increase of 1.6 storms from the beginning to the end of the record; but from 1930 onward, the trend was negative, revealing a linear decrease of 1.1 storms per year from 1930 to 1996. In addition, Bielic determined that there had been a decrease in the annual number of thunderstorms with hail over the period of record, and that there had also been a decrease in the frequency of storms producing precipitation greater than 20 mm. Two years later, Bielec-Bakowska (2003) analyzed thunderstorm occurrences at seven Polish synoptic weather stations over the period 1885-2000, determining that "over an annual period of 116 years, no clear trends of changes in the number of days with thunderstorms in Poland were found," noting also that "interannual variability of days with thunderstorms in individual seasons did not show any specific trend." Studying winter wind climate based on counts of quartz grains of different diameters obtained from peat bogs in Southwest Sweden, Bjorck and Clemmensen (2004) found that centennial-scale changes with high peaks during the Little Ice Age and low peaks during the Medieval Warm Period "seem to record longer-scale climatic variation in the frequency and severity of cold and stormy winters." Similarly, but studying a variety of air pressure indices for Lund (since 1780) and Stockholm (since 1823) in Sweden, Barring and von Storch (2004) found that their storminess proxies "show no indication of a long-term robust change towards a more vigorous storm climate." In fact, during "the entire historical period," in their words, storminess was "remarkably stable, with no systematic change and little transient variability." Likewise, working on the Scottish Outer Hebrides, Dawson et al. (2004a) employed similar techniques to construct a local chronology of strong windstorms, which indicated that the majority occurred "during episodes of climate deterioration both prior to and after the well-known period of Medieval warmth," further reporting that "dated inferred sand drift episodes across Europe show synchroneity with increased sand mobilization in SW France, NE England, SW Ireland and the Outer Hebrides, implying a regional response to storminess with increased sand invasion during the cool periods of the Little Ice Age," citing the corroborative works of Lamb (1995), Wintle et al. (1998), Gilbertson et al. (1999) and Wilson et al. (2001). Continuing, for five locations scattered across Scotland, northwest Ireland and Iceland, Dawson et al. (2004b) found a greater frequency of storminess in the cooler 1800s and early 1900s than throughout the remainder of the warmer 20th century; and they report that "considered over the last ca. 2000 years, it would appear that winter storminess and climate-driven coastal erosion was at a minimum during the Medieval Warm Period." Likewise, based on hourly records of 10-m wind speed observations made at thirteen meteorological stations scattered across the country for the time period 1962-2002, Smits et al. (2005) found "a decrease in storminess over the Netherlands [of] between 5 and 10% per decade." And in studying two cores of the Pierre Blanche lagoon just south of Montpellier, France, Sabatier et al. (2008) determined that washover deposits "provided evidence of three main storms," which they identified as occurring in 1742, 1839 and 1893, all of which were deemed to have been much stronger than any of the 20th century. Similarly, while working on the Danish island of Anholt, Clemmensen et al. (2007) found that a "period of sand drift and dune formation took place during the latter part of the Little Ice Age, which is characterized by increased (summer) storminess in large parts of NW Europe." And focusing on sub-Mediterranean Slovenia, while speaking of "violent storms" and "the periods in which these phenomena were more frequent and reached, as to the costs of damage caused, the level of natural disasters or even catastrophes," Ogrin (2007) reported that "the 17th and 18th centuries were undoubtedly such periods, particularly their first halves," when "the frequency of violent storms in that time was comparable to the incidence towards the end of the 20th century." In an interim review of the subject, Clarke and Rendell (2009) concluded that "the most notable Aeolian sand drift activity was concentrated in the historic period 0.5-0.1 ka (AD 1500-1900) which spans the Little Ice Age." And they stated that "within this period, low solar activity, during the Maunder (AD 1645-1715) and Dalton (AD 1790-1830) Minima, has been related to changes in Atlantic storm tracks (van der Schrier and Barkmeijer, 2005), anomalously cold winter and summer temperatures in Scandinavia (Bjerknes, 1965), and the repositioning of the polar front and changing sea ice cover (Ogilive and Jonsson, 2001)." In addition, they indicated that "the Holocene record of sand drift in western Europe includes episodes of movement corresponding to periods of Northern Hemisphere cooling (Bond et al., 1997) ... and provides the additional evidence that these periods, like the Little Ice Age, were also stormy." Publishing in the same year, and using "the series of thrice-daily sea level pressure observations at Lund and Stockholm," Barring and Fortuniak (2009) determined that "there is no significant overall long-term trend common to all indices in cyclone activity in the North Atlantic and European region since the Dalton minimum," that "the marked positive trend beginning around 1960 ended in the mid-1990s and has since then reversed," and that "this positive trend was more an effect of a 20th-century minimum in cyclone activity around 1960, rather than extraordinary high values in [the] 1990s." Likewise, Sorrel et al. (2009) linked high-resolution sediment and rock properties of materials found in cores collected from the Seine estuary in northwest France to climatic conditions of the past few thousand years, finding that "increased removal and transport of estuarine sediments occurred when winter storm activity greatly intensified over northwestern France," and they reported on "four prominent centennial-scale periods of stronger storminess, occurring with a pacing of ~1500 years," which they opined were "likely to be related to the last four [of] Bond's [1997, 2001] Holocene cold events," the most recent of which was the Little Ice Age. Most recently, Barredo (2010) published a paper entitled No upward trend in normalized windstorm losses in Europe: 1970-2008, which is probably all we need to say about it, while Sorell et al. (2010) documented the depositional history of the inner Bay of Vilaine in south Brittany along the French Atlantic coast. Their work, with sediment cores, indicated that "during ca. 880-1050 AD ... the influence of winter storminess was minimal," in accordance with the findings of Proctor et al. (2000) and Meeker and Mayewski (2002). Thereafter, however, noting that the Medieval Warm Period "is recognized as the warmest period of the last two millennia (Mayewski et al., 2004; Moberg et al., 2005)," they report that the upper successions of the sediment cores "mark the return to more energetic conditions in the Bay of Vilaine, with coarse sands and shelly sediments sealing the medieval clay intervals," and they state that "this shift most probably documents the transition from the Medieval Warm Period to the Little Ice Age," which led to the "increased storminess both in the marine and continental ecosystems (Lamb, 1979; Clarke and Rendell, 2009)" that was associated with "the formation of dune systems over a great variety of coastal environments in northern Europe: Denmark (Aagaard et al., 2007; Clemmensen et al., 2007, 2009; Matthews and Briffa, 2005), France (Meurisse et al., 2005), Netherlands (Jelgersma et al., 1995) and Scotland (Dawson et al., 2004a)." In considering all of the above findings, what does the future look like with respect to nearly all types of storms? Clearly, the evidentiary scale tips far, far away from climate-alarmist scenes of "weather gone wild," as there are almost no historical data that suggest that a warmer world experiences any more severe or more frequent storms than a colder world does. In fact, real-world data seem generally to suggest just the opposite.